It's shocking imagery, I know. 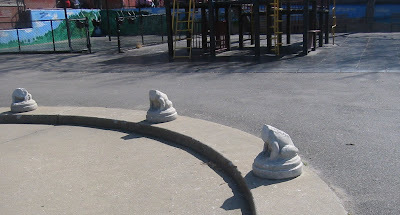 These poor frogs, all sitting in a circle around the sprinkler in the playground on 3rd Avenue and 40th Street. (Playground Three-Forty, if you want a name.) I don't usually frequent this playground, but it was totally empty...perhaps because of the exhaust coming from the BQE/Gowanus just feet away. I can't imagine that hacked off concrete is a particularly safe situation for kids running and shrieking during the warmer months when water sprays from the center of the frogs' circle. 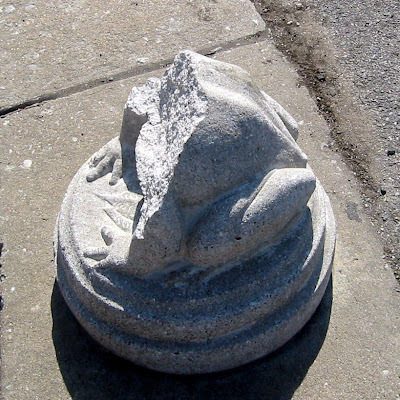 Sharp concrete frog necks versus soft, squishy child flesh and limbs = no good outcome. Since this area is maintained by both the BOE and NYC Parks, hopefully someone will get around to replacing or fixing up these amphibians. Another shocking discovery was that these frogs do not have webbed feet. Even frogs that live most of their time on land have SOME webbing, don't they? Are these actually Sphinx-like creatures? Perhaps the missing heads are actually human and that's what ticked off the vandals enough to destroy the tiny statues. what do people gain from doing things like this?